Nothing screams “summer” like the 16th Annual Roadhouse Brewfest. (Not this Roadhouse, this Roadhouse). Why? Live music, brews and BBQ – that’s why. This hugely popular McMenamins brew fest, held outside at Cornelius Pass Roadhouse, is open to all ages, features live music from noon – 9 p.m. and has 32 brews and ciders to choose from for folks 21 and older. 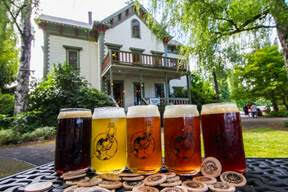 Pouring at the event are special sour ales and barrel-aged beers from McMenamins and guests. Guests can meet and mingle with the brewers, wander the grounds, grab a bite to eat and visit the on-site brewery and distillery throughout the day. Past selections have included Picasso Moon Pale Ale from John Barleycorns Brewery, Obama-Nation, a domestic Schwartzbier from the Crystal Brewery, a Belgian Abbey Ale called Blind Abbot from the Cornelius Pass Brewery and many others. Merchandise tent open Noon ‘til 8 p.m.